With their appearances on the Nuggets compilation and the T.A.M.I. 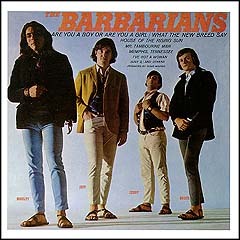 Show, The Barbarians are one of the best-remembered garage bands of the '60s. Not that it's easy to forget the sight of a one-handed drummer, complete with hook, driving his band through a garage-punk number in the company of the day's biggest British Invasion, soul, and surf stars. Moulty was hardly self-conscious about his handicap; on the tiny hit single immortalized on Nuggets (titled, logically enough, "Moulty"), he tells the story of the triumph over his loss in no uncertain melodramatic terms. The band also managed a somewhat bigger hit single, the British Invasion-inspired novelty "Are You a Boy or Are You a Girl." Formed in Cape Cod, Massachusetts, in 1963, The Barbarians got their big break in 1964, when they scored a slot on the T.A.M.I. Show. The band's barbaric, nonconformist image was a big part of their appeal. They grew their hair longer than most of their contemporaries and wore leather sandals instead of Beatle boots. And then there was their drummer Moulty, who had a hook for a left hand. Deciding to capitalize on Moulty's disability, The Barbarians' producer, Doug Morris, talked our hook handed hero into recording this "autobiographical" soliloquy in early '66 using Dylan's group, The Hawks (aka The Band), as accompanists. The song's simple message - never give up no matter what the odds - was sincere enough, and it tugged enough heart strings to become a minor hit. But the single was an embarrassment for the group. Moulty was so furious when he found out that the track had been released that he flew straight to New York and chased the president of Laurie Records around his office, breaking copies of the single over his head. Not surprisingly, the band parted company with the label soon afterwards. Moulty: That's more than just a rumor. A lot of the Hawks - the Bob Dylan band - backed me up on 'Moulty.' I stayed in New York with my manager and road manager to try the 'Moulty' thing. I sent the rest of the band back to Boston. We were just going to try this thing, so we brought in Dylan's band, and we put it together. Just to try it. But it worked well, so they kept it. But as soon as the kids started yelling for 'Moulty' we had to learn the song. Discoveries: How many songs did the musicians from the Band play on? Moulty: Just 'Moulty.' They were great to work with. The harp player was an older gentlemen, a real professional. We had a great session. It went very smoothly because of Doug Morris. I did my thing, rearranged the words, did my talking, making it real. There's a unique little story about 'Moulty.' When that song came out, the reaction we got was odd and unexpected. When we'd play that song, it would do something to a lot of these kids out there. We noticed kids by the droves would come up crying and broken down. Some of the words in the song hit them hard. They would come and say things to me: 'I wouldn't have made it through such-and-such a time if it wasn't for that song.' They would hug me and break down and cry. The words to the song are true. I didn't make that up. All young people - all people - are hurting inside, and we have fears and hurts and things we try to overcome. Sometimes we try to cover them up, but they are there. A lot of people would tell me, 'If it wasn't for that song I wouldn't have made it through my senior year,' or 'I would have committed suicide.' They weren't afraid to break down about it. So I understood it was a little more than a rock 'n' roll song for these kids. I hit these kids in the heart. And it still goes on today. I didn't realize that would happen. I didn't even want them to release the thing. Discoveries: Was your anger about 'Moulty' based on the fact that the Band played on it rather the Barbarians themselves? Moulty: No. I made a deal with them that if I didn't want it released, they wouldn't release it. I said, 'No.' Then they released it behind my back. We were mad. But to our surprise, it charted.